Junior Engineers (Civil, Mechanical, Electrical and Quantity Surveying & Contract) Examination, 2017 was conducted by the Commission from 22.01.2018 to 29.01.2018 in various centers all over the country. Maximum salary of Junior Engineers starts from 31,071/mo. * including 94 SC, 130 ST and 980 OBC category candidates who are qualified as per UR standard. ^includes 05 SC, 01 ST, 27 OBC and 17 UR category candidates. ^^includes 02 SC,19 OBC and 19 UR category candidates. * including 15 SC, 03 ST and 312 OBC category candidates who are qualified as per UR standard. Includes 04 SC, 06 OBC and 08 UR category candidates. ^^includes 01 ST, 06 OBC and 11 UR category candidates. 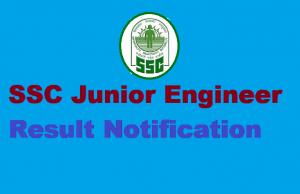 Note I: Candidates belonging to reserved categories meeting the cut-off fixed for UR category of SSC are shown under UR category in both the Lists. 4.Regional Office of the Commission immediately. 5. Representations received from the candidates about the answer keys have been carefully examined and the answer keys have been modified wherever necessary. The modified answer keys have been used for evaluation. 6. The result is available on SSC’s Website. 7. The Descriptive Paper (Paper-II) of Junior Engineers Examination 2017 will be conducted on 29.04.2018 and the admit cards for the same will be available on the websites of the concerned Regional Offices in due course. 8. Marks of the qualified/non-qualified candidates and Final Answer Keys along with the Question Paper(s) in a standard format will be hosted shortly on the Commission’s website – http://ssc.nic.in.